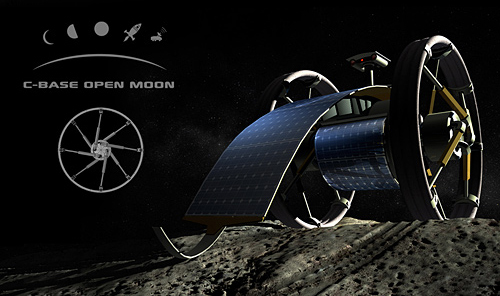 To achieve our goal to win the Google Lunar X-Prize we indent to make use of existing technologies. We will not develop our own technologies as this is far beyond our capabilities. So we will use a standard approach to reach the moon. The next step will be the transfer to the Moon. For this purpose we need a spaceship that is capable to carry a Moon lander and to perform the acceleration maneuver in Earth orbit and the deceleration maneuver for moon orbit injection. This spaceship cannot be bought as is, instead we intend to modify a standard satellite bus (as is produced by several space companies) for our needs. Orbiting the moon we need to descent to its surface. This is done by the Moon Lander. There are two alternative approaches: 1. Reduce velocity and altitude down to an acceptable extent and then deflate an airbag-like device to cushion the hard landing (the Lunar approach). 2. Use thrusters all the time to perform a soft landing (this is the more demanding Apollo approach). Landed on the Moon we will release our Moon rover. The c-rove carries two main payloads: a high definition CCD camera and a transmitter for the Earth downlink. Depending on the scenario chosen for Stage 4 the Moon Lander could be used as a relay station. As the construction of the Moon rover is much more straightforward than that of a spaceship we intend to build it on our own (i.e. the Comoonity). Alternatively we have contacts to other Moon rover projects. It is difficult to overestimate the necessity and, as we believe, the impact of the GLXP competition. There is no doubt that we are standing on the edge of the massive economic exploration of near space, a revolution which in some parts like the satellite business is in full activity already. But there are more or less still the old players, the big national aerospace agencies, who are sharing the stakes between each other, so that the vast majority of the population of this planet is just a spectator on the brink of this huge pitch. The GLXP has clearly the potential to be the beginning of the end of this situation. As already mentioned on the GLXP site, it’s not unlike the time, when a certain Charles Lindbergh followed the call for a prize, and initiated with his success the transatlantic air-traffic within a few years. But there’s as well something which is different to those days long ago. These days we’ve got the Internet, we’ve got global communication and information exchange – within seconds. The scope of such a competition is not comparable to any preceeding one in the relatively young history of industrialization. Everything we do we’re doing in front of the eyes of the world, and so this is not only a game for the richer part of our societies, we have to talk about our responsibility towards this planet, our inevitable obligation to solve the shameful problems which our societies are still struggling with. It may look somehow far-fetched, but I’m certainly not the only one who believes, that at least parts of our immense problems could be solved with the entrance into the never ending spaces surrounding us, may it be our energy problems or may it be the threat our industrial production is causing to our nature and to our resources. Please don’t forget, there is a reason for the ‘Open’ in Open Moon. We do not have any ready usable technologies for accomplishing this immense endeavour, as well as our approach is not only a technological one. As a consesequence of the Apollo programme, which inspired thousands of us, but stayed without significant consequences in terms of an extraterrestial economic exploration, we urgently want to develop business models, which shall lead to a sustainable impact for small and medium enterprises. So good Space business models are for us as valuable as for example cheap and effective Space transportation technologies. Innovative management is key to our successfully completing the complex, technical challenge set by the Google Lunar X-Prize competition. In our view innovative management is far more than utilising systematic business processes to set new standards in innovation by searching, finding and realising technologies or processes. This is challenge enough in itself. However, to manage and change conditions within a specific environment, culture and company strategy resulting in more and better innovation requires a particular kind of innovation manager. To meet this challenge we will affiliate with business groups and corporate networks. We want to tap into great potential to gain more from innovation. We will use interaction, knowledge, management and information technology as our base. We will combine openess and confidence with process, structure and control. Our innovation is open to all. Everyone is invited to design, create and develop. The individual creator is protected by a license for each of his ideas. Thus, a cooperative value is created and, at the same time protected, by a process which allows for give and take, sharing and incentives. And Open Moon has even more to offer. We want to demonstrate that our community is able to realise lunar flights. We not only develop bits and bytes, but also engines and related systems. The open innovation car is mentioned here as an example. However, we do not forget that we are in a competition, and that whoever first fulfils the competition requirements on the moon will win the prize. The pressures on open innovation in terms of time available and current economic conditions are no different from those on any other company or enterprise. So we move forwards using approved and new management methods to connect the power of open innovation with corporate networks. Together we will build a community in space. Join us for the next step.